One of the largest mergers this year hopes to bring more convenient healthcare to residents of rural North Carolina, according to leaders of the two entities. 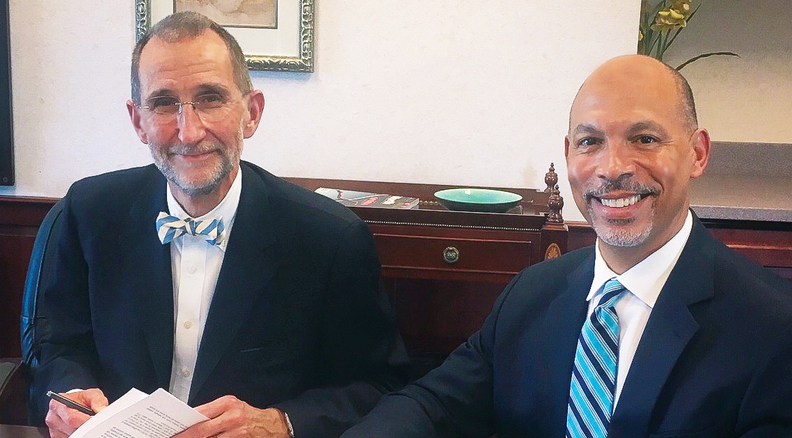 Carolinas HealthCare System and UNC Health Care have signed a letter of intent to create a joint venture, combining North Carolina's renowned academic health system with the state's largest hospital chain. The two systems announced late last week that they have started exclusive negotiations to join their clinical, medical education and research resources, and they intend to enter final agreements by year-end. The combined organization would have about $14 billion in annual operating revenue. Eugene Woods, president and CEO of 47-hospital Carolinas HealthCare System will become CEO of the yet-to-be-named combined entity. Dr. William Roper, CEO of 12-hospital UNC Health Care and dean of the UNC School of Medicine, will become the executive chairman of the organization. For Woods and Roper, the partnership aims to improve healthcare access, particularly for patients in rural and underserved parts of the state. About 70% of the state's population would be within 20 miles of one of the combined organization's facilities, Woods said. "We will be stronger together, able to do more for the people we serve across our state and beyond, especially those in rural areas, which is one of the real health challenges that North Carolina and others face," Roper said. Carolinas and UNC together have 14 hospitals located in rural North Carolina. Carolinas HealthCare, based in Charlotte, reported operating revenue of about $9.4 billion in 2016. The system includes more than 7,600 licensed beds and employs more than 60,000 full-time and part-time workers. Chapel Hill-based UNC Health Care, which is owned by the state, recorded $4.56 billion in operating revenue for its fiscal year ended June 30. It has 2,785 beds and employs 1,864 physicians. Together, the combined organization would employ 3,936 physicians and more broadly, about 100,000 employees. The deal must win regulatory approval. The two CEOs and their boards began discussing a partnership over the summer. In the last week and a half, they met with North Carolina elected officials about the joint venture, including Gov. Roy Cooper and Attorney General Josh Stein. Roper said he also spoke with Blue Cross and Blue Shield North Carolina CEO Brad Wilson about opportunities for partnering with the combined healthcare system. Elected officials, the health systems' employees and others have responded well to the partnership announcement, Roper said. But the Federal Trade Commission has recently come down hard on proposed hospital mergers in other states, stating huge consolidation raises prices for consumers. Carolinas and UNC don't anticipate any antitrust issues and said competition will remain strong in the state. That's despite the U.S. Justice Department last year suing Carolinas, saying it illegally placed restrictions in its contracts with insurers that forbids them from offering narrow networks that steer patients. A U.S. District Court judge earlier this year ruled that the DOJ had proven Carolinas takes advantage of its market power in Charlotte in ways that raise prices for patients. Carolinas HealthCare has said that it follows the law and that it is dedicated to making health care more affordable. In Charlotte, Carolinas' largest competitor is Novant Health, which owns 14 hospitals in North Carolina and Virginia. Woods said he's confident Carolinas and UNC don't have much geographic overlap, which would ease FTC concerns. The systems hope to secure the agency's approval by next summer. The systems also anticipate needing more talent as the combined organization grows. They serve about half of the 200,000 discharges from rural hospitals in the state. The CEOs hope to combine capabilities to transform the way care is delivered to patients in those parts of the state, through telehealth and other new models of care, but also to create sustainability in terms of jobs, Woods said. The joint venture could also serve to recruit physicians if it results in the city's first medical school. The combined system will also focus heavily on advancing cancer treatment. UNC is a National Cancer Institute-designated cancer center with more than $70 million in cancer research grants from the National Institutes of Health, while Carolinas cares for more than 10,000 cancer patients per year at its Levine Cancer Institute. "You combine that together and it really is incredible in terms of the world-class clinician access that every Carolinian will have, and will frankly not have to travel outside of their communities in the state to receive," Woods said. An​ edited​ version​ of​ this​ story​ can​ be​ found​ in​ Modern​ Healthcare's​ Sept.​ 4​ print​ edition.